Special Counsel Robert Mueller is clearly closing in on Donald Trump, as evidenced by the rapid succession of Trump’s key associates cutting plea deals, obtaining immunity deals, and being convicted of felonies. Trump surely has some kind of last ditch plan up his sleeve to save himself, right? Even if it’s a weak one, he’ll still have the element of surprise, right? It’s not as if his attorney Rudy Giuliani is just going to blurt it out in advance… right? Well, he just did – and it’s terrible. 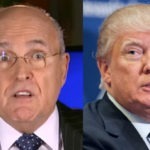 Rudy “motormouth” Giuliani gave an interview to the Daily Beast today in which he revealed that he and Donald Trump are secretly planning to publish a “counter-report” which will dispute Robert Mueller’s legitimacy. That’s right, Trump isn’t even going to bother to try to claim that he’s innocent; instead he’s merely going to throw some sheer nonsense about Mueller into a report, in the hope of muddying the waters. Let’s count the ways in which this won’t accomplish squat. For starters, Giuliani is admitting that everything he and Trump are going to put in this report is going to be stuff that the average person could find on Google. In other words, it’ll be a copy-paste job from pro-Trump propaganda sites that have invented phony conspiracy theories about Mueller and the FBI; it’ll read a lot like the garbage you find in Trump’s average Twitter rant. Beyond the fact that this is a really stupid idea, and the fact that Rudy just blew the element of surprise anyway, this reveals the fundamental error that Trump and Rudy are making in their assumptions. Rudy Giuliani is still insisting that Robert Mueller is simply going to file a report about Donald Trump’s crimes and then go home. Back in the real world, there is no chance it’ll play out this way. Mueller didn’t come out of retirement and spend all this time and effort exposing a treasonous illegitimate president, just to write a book report. Whatever Mueller’s endgame is, it’ll be far more aggressive than that. Yet Trump and Rudy think they can magically strike Mueller down with a book report of their own. They’re completely delusional.